It’s been an exciting year for me. My software powers the corporate alumni networks of some of the world’s largest companies. Alumni are the largest talent pool on the planet and gig work, contingent labour and people returning to their former employers (aka boomerang workers), are forming a huge chunk of the corporate workforce, which is only set to continue to increase. We are fortunate to be in the right place at the right time and are working hard to ensure it stays that way, too. Our customers are global, our banking is multi-currency and our team is international. We’re in with a fighting chance of reaching the finals of University Challenge if they ever decide to run an engineering, coding and modern languages series. We’re constantly ordering more desks for our ever-increasing team in the US and we’re getting ready to open a bigger EMEA hub in London early next year. I’ve become an expert on time zones as well as technology. Sometimes I pinch myself; we have inbound leads, quality customers (who like us, I promise! ), supportive shareholders and a market that wants our product. Sometimes I get a little panicked too because with growth comes challenges – daily challenges at that, and big ones. Anyone who says business is easy isn’t telling the truth, but it helps that my co-founder is also my brother James. I have an equal who I trust implicitly, on the same team proving priceless. My friend Dan Ritterband hit the nail on the head some time ago when I felt a little overwhelmed, he said: “You’ve been in training for this your whole life.” It’s a phrase that has stuck with me because it’s true. The ups, downs and long days have taught me a great deal and now I finally feel in a position to implement what I’ve learned with EnterpriseAlumni, and of course, continue to learn more. However, a few weeks ago I met some young people who haven’t been quite as fortunate. My role also includes being a Unicef UK business advisor and I recently travelled to Azraq refugee camp in Jordan where I met a very different entrepreneurial community; not the usual incubator or start-up hub I might usually be called to give a keynote speech at. Right now, 50 million children have been uprooted from their homes. They’re missing out on the chance to fulfil their potential and their lives are on hold at a time when they should be free from worries and in education, preparing for their future. This is unfair, devastating in fact, and something I wanted to help address. Unicef’s initial project is to support aspiring young entrepreneurs who have faced unimaginable hardships; many have lost their family, friends and their chance to go to school. I’m raising funds to help roll out ‘Innovation Labs’ where these young people can receive support, seed funding and training in highly-sought-after digital skills. 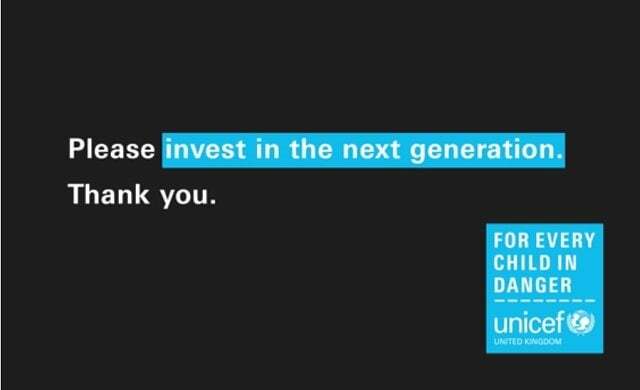 It’s Unicef UK’s first crowdfund and I’m proud to be leading it. Here in the UK we are blessed with so many resources. If you’re young and keen to start a business then inspiration is accessible and everywhere but, in other parts of the world – like Jordan – resources are scarce. Despite the very challenging circumstances the young people from Jordan find themselves in, I heard about their aspirations and saw projects they’re rolling out with practically no resources in order to improve life in the camps. These projects included a movie projector made with cardboard, tape and an old magnifying glass, and an air conditioner unit made from a scrap of solar panel, loose wires, a tiny fan and a battered base from a cool box. These young people have such an appetite to learn to code and build businesses and I think that we can provide a different kind of school to help prepare them for their future lives, wherever they settle. We launch Innovation Labs on Monday 18 September and in advance, some of the UK’s most fascinating entrepreneurs, journalists and figures have so kindly agreed to auction their time (plus some very cool experiences) to help kick off the fundraising and help me achieve my target as fast as possible. Keen to meet serial entrepreneur Brent Hoberman MBE and pick his brains? Want to go surfing with Jim Cregan of Jimmy’s Ice Coffee? Want to meet Guardian Women founder Harriet Minter and have an episode of Talk Radio’s Badass Women’s Hour dedicated to you? How does meeting with amazing female entrepreneurs like Sarah Wood of Unruly, Kathryn Parsons of Decoded or Tamara Lohan of Mr & Mrs Smith sound? Or perhaps you want to better understand investing? You can bid to win lunch with the personal finance editor of the Financial Times? F&B entrepreneur or a keen interest in food? Learn to cook with the Founder of Planet Organic at her house in Tuscany. Or submit a bid to shadow the chief chocolatier at Britain’s most innovative chocolate company, Montezuma’s, at their factory and hand-make chocolate bars, truffles and even Easter eggs. Interested? Good! Browse the entrepreneur action here and get bidding! By bidding, you’ll be investing in the next generation of thinkers and innovators. Even if you’re a start-up on a very tight budget, you can enter our £10 draw to win lunch with mmyself and a gang of entrepreneurs. Alternatively, you can pre-pledge for the crowdfunding round here. To borrow from Tesco’s advertising campaign, every little helps! And remember – some of the greatest innovators of our time were refugees so we are helping ourselves by giving these children a chance. The next Google or Einstein and your and my future employees could be amongst them.